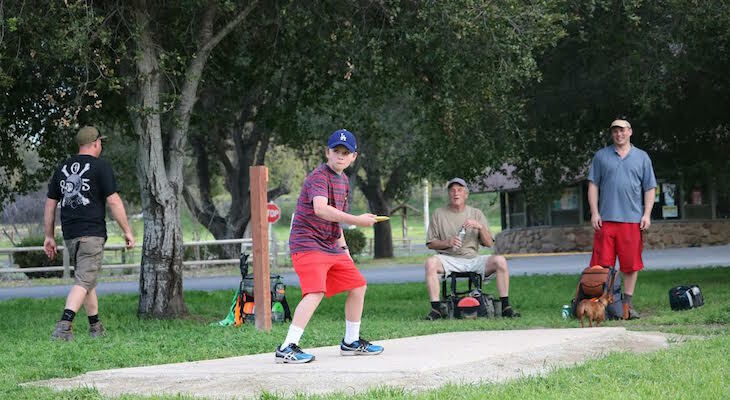 A new 18-hole championship level disc golf course is now open at Cachuma Lake. The course was designed in collaboration with local professional disc golf players and features incredible views of Cachuma Lake and the San Rafael and Santa Ynez mountains. All skill levels are invited to enjoy the growing sport of disc golf. The course is mixed with oak tree framed technical challenges and long distance holes to test both skill and power. The course is designed to challenge expert and recreational players, yet still be enjoyable for kids and beginners. Each hole along the 2.25 mile course has multiple basket positions making the course different every time it’s played. The course begins and ends in front of the Cachuma Store where players can pick up a course map, a new disc and provisions as they venture out for a fantastic day of disc golf among the old growth oaks. Played much like traditional golf, disc golf uses a disc in the place of ball and clubs. The intent of the game is to throw a disc into an elevated metal basket. The player moves from “tee” to “hole” through the trees, shrubs and terrain that change in and around the “fairways” that provide challenging obstacles. Ultimately, the “putt” is tossed into the basket and the hole is completed. The goal of disc golf is to complete the course in the fewest number of shots. Cachuma Lake Recreation Area is located along State Highway 154 and only 23 miles from Santa Barbara, 8 miles from the town of Santa Ynez or 12 miles from Solvang. The park offers year-round camping, fishing and recreation opportunities. There is no cost to play disc golf; however there is a $10 per auto day-use fee. Annual passes are available with discounts for Santa Barbara County residents. For more information about Cachuma Lake activities and other County parks, visit www.sbparks.org.